South Tyneside Council aims to respond to the most severe potholes within two hours of being made aware of them, new figures show. Research by the RAC Foundation found that the authority is unlikely to investigate potholes which have depth of 40mm or less. Three councils, Flintshire, Cumbria and South Lanarkshire, attempt to fix potholes immediately and another 16 aim to patch things up within an hour, and five within 90 minutes. 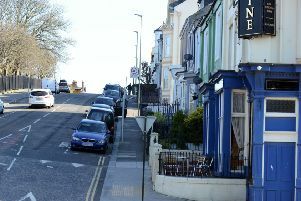 The most common response time to the most urgent problems is two hours, with 79 councils including South Tyneside looking to patch up roads in that time. Council chiefs in South Tyneside have told of the importance of highway maintenance and say that central government cuts mean that the borough is facing a backlog of £69million to bring its roads up to standard. Analysis by the RAC Foundation shows that highway authorities across the country are increasingly adopting the ‘risk-based’ approach to fixing road defects. This means, for example, that not only will the size, width and depth of a pothole be taken into account, but also the type of road it is on, the volume of traffic and the mix of road users. Although a risk-based approach is becoming increasingly common, almost all authorities still set minimum investigation levels – based on depth and width measurements – below which they won’t assess potholes, nor assign response times based on the dangers they pose. Coun Nancy Maxwell, lead member for area management and community safety at South Tyneside Council, said: “We know how important the maintenance of our highways is for road safety and work in accordance with best practice and national codes of practice to reduce the risk to highways users with potholes repaired within either 24 hours or ten days of them being identified depending on their location or severity. Steve Gooding, director of the RAC Foundation, said: “It is good to see that the vast majority of local highway authorities are adopting the best practice ‘risk-based’ approach.